Jack Madigan should be leading an enviable life. He’s the sole heir of a ’70s rock icon. He lives with his retro-obsessed teenage son, Harlan, in a once-magnificent Boston town house. But now 36, Jack’s painting career is buckling under a raging case of agoraphobia. And when the foreclosure notice arrives, Jack must face losing the only home he’s ever known—and his only safe zone. When Jack’s ex-wife announces that Harlan would be better off living with her and her vitamin-enriched fiancé, Jack has to figure out how to deter the perky, inexperienced real-estate agent, hold on to his house, keep his son at home, and—through the tenacity of the little girl next door—finally step out onto the sidewalk. Fox 2000 swooped in to pre-empt the film rights while Town House was still on submission to publishers. Ridley Scott’s Scott Free Productions is set to produce the movie and Pulitzer Prize-winning screenwriter Doug Wright (Memoirs of a Geisha) is adapting the screenplay. A book with the ability to both entertain and move us, Town House is a smart, acerbic novel bursting with heart and quirky charm. TISH COHEN is the author of bestselling novels for adults and young readers, many of them in development for film. 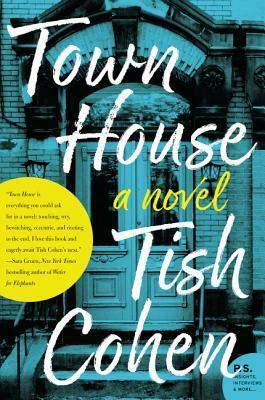 Her first novel, Town House, was a regional finalist for the Commonwealth Writers’ Prize for Best First Book. Her more recent novel, The Truth About Delilah Blue, was a Globe and Mail Best Book. Cohen recently sold an original TV series to ABC/Corus Entertainment, and her short film, Russet Season, premiered at the Toronto Jewish Film Festival in 2017. She lives in Toronto and Creemore, Ontario, where she rides dressage, accompanied by a most inappropriate farm dog, her Standard Poodle, Gracie.